Take your favorite Star Wars characters with you wherever you go with this collectible plush clip-on! This 4-inch tall plush depicts everyone's favorite droid, R2-D2! Better yet, this plush speaks phrases from the movie! Includes sturdy plastic hang clip. Take your favorite Star Wars characters with you wherever you go with this collectible plush clip-on! 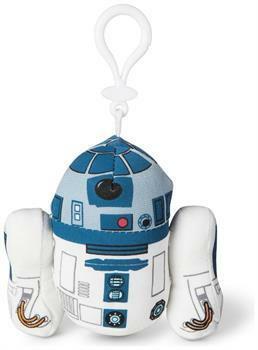 Plush depicts everyone's favorite droid, R2-D2! Plush speaks phrases from the movie! Includes sturdy plastic hang clip. Officially licensed. Collect them all!